Is it because the next holiday will be Scotland or some other reason, but I recently find myself fascinated by the so-called “Pictish stones”. The first time I saw the strange Pictisch symbols was about a decade ago in the fascinating book “Noord-Europese Mysterieën En Hun Sporen Tot Heden” (‘North-European mysteries and their traces to the precent’) (1970) by the Dutch author Frans Eduard Farwerck (1889-1969). He displays several stones, but the Golspie stone is the most fascinating. It not only contains (virtually) every Pictish symbol that we know, but also supports Farwerck’s theory about the symbolism. A theory that I have not found on the world wide web yet, so I figured my scribblings might add something to the information about the Pictish stones that is already available on the web, which is not little to begin with. When the meanings of the symbols are disputed, even the history of the Picts is! It looks like the Picts were the original inhabitants of Scotland. They must have been around in the first or at least second century CE, because when the Romans invaded the British isle in the third century, the Picts were already a force to take into account. They were not such a large society, but this came later. From about 600 to 800 some people speak about a “Pictish nation”. After that the Picts were troubled by the Viking invasions and overrun (or perhaps they just merged with) the neighbouring Gaelic tribes. After 800 there seem to have been no more Picts. A nice note for people who (like me) enjoy the Männerbünde theories (as does Farwerck, but it seems he did not mention this), the name the Romans gave to the tribes they ran into is “Picti”, which supposedly means “the painted ones”. The Picts certainly had an art of their own. The rock-carvings and stones contain symbols completely unknown anywhere else. What is more, because the meaning of the symbols elude us, wild theories have been formed about the Picts. For a time, scholars thought that they spoke a non-Indo-European language. This and other theories have later been debunked. It seems rather generally accepted that the stones were erected from around 500 to 700 CE, the ‘high time’ of the Picts. An old theory that is not regarded entirely fitting nowadays, but still in use, divides the stones in three “classes”. Class I have the typical, Pictish geometrical symbols, class II Pictish imaginary together with Christian and class III purely Christian. The first two classes are most interesting to us. As you can see on the Golspie stone, there are very different kind of symbols. Animals that are recognisable, animals that are not, geometrical symbols and strange, minimalistic drawings. People have been trying to categorise the symbols coming to numbers ranging from 25 to 40. Remarkably enough I have not been able to find much attempts to explain the symbols. Most websites do not come further than the notion that the meaning of the symbols have been lost in time. Others add that some people think that the animals could refer to tribes. Of course interpreting the symbols is hard when you do not know what the stones were for exactly. Almost no stone is presently at the original location. For a while there was the idea that the stones were gravestones, but in by far most of the stones this seems not to be the case. Perhaps they are more like the rune- and picturestones of Scandinavia simply stating “this land belongs to me” or perhaps “I have been to thereandthere”. But why then are the symbols so consistent in time and place? Unfortunately I have not yet found any dating for any stone. When paging through the Strathclyde database (see reference below) it occurs to me that the symbols were originally carved in caves, later on stones and as time passed, the stonemasons got better in what they did and the images became more and more detailed. Roughly said, the more detailed stones would be the more recent. When investigating the symbolism, this does not really matter though, since, like I said, the symbols remained the same for a long time. So far I have found only one brave attempt to interpret the Pictish symbols. This is immediately a rather uncommon interpretation though. The website is called “Pictish Mithraism” which also tells you in what direction the interpretations go. The author argues against several of the standing hypothesis, both the symbolic and the historic ones. The biggest merit of the website is that the author categorises the symbols and tells his readers how he came to his interpretations. Unfortunately the website does not navigate all that well and you have to find PDF-files in order to read the different sections. At the bottom of this article I have made a little gallery so you can see what we are talking about. Many symbols are so weird, that they are referred to with descriptive terms such as “double disc and Z-rod”, “notched rectangle and Z-rod” or “crescent and Z-rod” (when you see the pictures it will be obvious what is what). There is also this very typical, often recurring animal that nobody seems to know what to make of. Personally I find it looking like a sea-horse (sometimes a bit of a normal horse), other people have suggested elephant, dolphin even dragon and the monster of Log Ness. What investigators agreed upon is just calling it the “Pictish beast”. All this was just to show a bit the difficulty of the symbolism. Now, let us have a look. Please scroll down and click on the first image, which is the famous stone standing in Aberlemno. You can clearly see this big, weird, fascinating symbol, two attached discs crossed by a mirrored Z. To the right there is a symbol that is called “mirror” and on the top you can see a snake. I will return to this symbol. In the next image you see the same symbol together with the other often used and enigmatic Pictish symbol, that of the crescent. As you can see, both the connected discs and the crescent are crossed by a line. Sometimes these cross-lines are left out (image 6), sometimes they are clearly made run ‘over’ eachother as you can see in image three. Is there significance in the ways these lines run? Image 4 suggests that the lines have a meaning of their own, since here we see two connected discs without the line and two other discs with. Animals, always nice. Many stones depict a bull (or something), others (as we saw) snakes or fish. In image 5 we see the “double disc and Z-rod” with a fish. Other images with fish suggest that it is not there by accident. Especially the snake is interesting, because on quite a few stones it seems to replace the connected discs as you can see in image 7. Highly suggestive are the Oghams on this stone by the way! Image 8 has the crossed crescent and two discs unconnected. Is there extra significance in the connecting lines? What I also found remarkable is that the “class II” stones sometimes remind of Scandinavian picture stones with human being together with symbols. In image 9 we find the crossed double discs together with two nights and in image 10 the crescent. I cannot help thinking of the Swedish stone with people on horses and a Valknut. A Valknut?!? Do you see that in image 11? I am not able to answer all the questions that I posed above, but here follow a few things about a few of these symbols. The three steps occur two times in Freemasonry: at the initiation and later, when the three steps over the grave of Hiram Abiff are discussed. These three steps over the grave, also show on some tableaux. Image 13 is not too clear, but have a good look at the dotted line over the coffin, it makes an angular S-form. Farwerck continues with describing the three steps in the Germanic past. He mentions the Picts who made memorial stones and suggests that they did that commissioned by their Northern lords (p. 553/4). The on the Scotish memorial stones often reoccuring lines also consists of three parts and an arrow and a pintail that probably indicated the direction to be followed. Sometimes the arrow-head is depicted as a threeshoot, the symbol for revival, which offers an explanation for this motif. In this respect it is significant, that the line often ends at a symbol of this form [drawn crossed crescent]. Above in discussing the compass and the square we saw that this is one of the forms of the ing-rune which means descendant, successor, new life, god’s son, etc. Now the question if the tripartite line and the ing-rune perhaps indicate a path through the underworld and the taking place of a revival is apparent. After this the author goes on with the connected circles that the tripartite line crosses. He states that this is an ancient symbol which can be found on 3000 year old rockcarvings from Sweden (he gives to photos but does not say which carvings he photographed). Some of these rockcarvings are accompanied by (foot)soles which bring back the connection with the steps. In the example snakes can be found below the symbol which could refer to the underworld. And right of the symbol there is the ing-rune of revival. Then Farwerck says that such circles are often divided in six parts which would be a reference to the sun so there we have a symbol of two suns. Farwerck does not say a whole lot about the two suns in this section of his book, but connects the symbol of the connected circes (when placed above eachother) of a Futhark (rune alphabet) in which it is the odal-rune, the rune for “fatherland”, “landed estate”, “possession”, etc. (p. 556). In the author’s eyes the connected globes refer to the land, or the earth, and the three steps go to the under- and the overworld. Returning to the Golspie stone, the way the man steps towards the globes, could well substantiate Farwerck’s hypothesis. The hammer-like thing that the man has in his hand is most likely a sacred object, perhaps even used in initiation. The Golspie stone also has two snakes at the bottom (the Midgard snake or a reference to the underworld?). Interesting is that the “Pictish beast” is almost at the top and always at the top is the “notched rectangle”, a symbol that the author of Pictish Mithraism sees as representing a Mithraeum, like he does in other symbols. That would be somewhat strange when the vertical order would say something about the meaning of symbols. What could be an interesting notion is that Pictish Mithraism suggests that the “Pictish beast” could represent the soul. Shortly I want to draw your attention to something else that Farwerck refers to a couple of times. You have seen the photo of the “double disc and Z-rod” and the fish. Farwerck keeps referring to this and similar arrangements as “the line ends with a fish” or “with a wolf” or (as we saw before) with the crossed crescent. Fish, wolf and the snake that is often present are animals that Odin/Wodan (the God of initiation) can change himself into. That is all he has to say about it, but when accepting that the rod is a route (of initiation) in a certain direction, image with which it ends, could be suggestive. Generally, some authors have suggested that in case the symbols are combined with more recognisable images, the latter could say something about the first, so this could be something to look at. There is also a “double disc and Z-rod” under a cross. It would be tempting to see a Christianisation there. 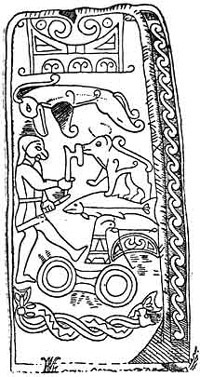 There is more that Farwerck has to say about these Pictish stones. His 40 year old interpretations are different from anything else I have ran into. Of course his interpretations fit his scheme, or better said, he uses these stones as example to back up his theory, but I think we have a few nice leads here to think further about the symbols on the Pictish stones. I am making serious, though amateurish geographic connections between Pictish symbolism and the North Atlantic Ocean floor around the Ireland Trough and the Lorien Bank. But my EXTREME puzzlement to me is your display of the Masonic Compass, Framing Square, and “letter G”. Is that ALSO a Pictish Symbol? Trust me, I am the least likely person to realize that Pictish Symbols reflected geographic tribal boundaries, when the middle of the Atlantic was dry in many vast areas, down to habitats visible in Google Earth at -17,000 feet deep today. Edward, read the text again, but more attentively. First, I do not represent my theory, but that of a Dutch author. Second, I do not say that all symbols that I display are Pictish, rather that the Pictish symbols are one of the possible sources of -for example- one of the layers in some Masonic symbolism. Great article! Great to see enthusiasm for the Picts is not confined to Scotland. You may be interested in my blog/ book on Pictish symbolism, and my interpretation of the symbols. The blog can be found at http://lastofthedruids.com/. Thank you Ian, I will have a look at your theories. At first sight I am reminded of Ulansey’s ideas about Mithraic symbolism. Pure guesswork on my part — I have no training or expertise in Picts or their symbols. But my guess for the double disks with Z-bar is that it denotes a political alliance or the conveyance of real estate. Two areas of land once separated by warfare have broken their weapons and are now united, part and parcel. If you straighten the ‘spear’, the two orbs would be on different sides. Break it into a Z and they’re now side-by-side. I’m very curious about the triangular hinges that join the bent arrows/spears. They’re almost always there, so they must mean something. Thinking of old fashioned carpenters’ measuring sticks — the kind that fold over several times for convenience — makes me think perhaps these ‘arrows/spears’ might actually be tools of measurement, not weapons at all. In the context of the twin orbs, a measuring stick symbol may indicate an ‘official’ measurement, delineating lawful property rights, not unlike a surveyor’s stake that marks a property line. There’s my two cents. And worth every penny! An angle new to me. Always nice. Thanks. Notice the similarities in the art and the symbols. Maybe some connections. I am just an interested amateur wondering about her (possible) ancestors and about who occupied this land before her…one who lives in Strathclyde – but who has also lived in Fife/Perth/Kinross (where very many stones still stand and where the Picts (Pechts = ‘the old ones’ or ‘the ancestors’ btw) were clearly in situ for a long time). I was fascinated by the similarities between Scythian and Pictish art… and all the ancient reports of ‘Scythians’ being of red hair/green(& also blue) eyed/pale skinned appearance. It could all be romantic myth and so much nonsense of course… we humans all too often write our theories based on what we want to be true… or what fits our own worldviews. The Picts could have been earlier wave ‘Vikings’ (Scandic or Russo or similar). Thank you for your thoughts. I am just an interested amateur as well. Also I’ve been caught by Scotland this this fall I am probably coming up there for the fifth time.